Bob Baffert became the first trainer with consecutive Travers winners since Shug McGaughey in 1989-'90. SARATOGA SPRINGS, N.Y. — This was all very familiar. It was a year ago at Saratoga Race Course, a movie set from the 1920s dropped into a small, modern upstate New York city, that a racehorse became a star. On that day it was Arrogate, a dark grey three-year-old from trainer Bob Baffert’s California barn, who rolled to a stunning, 13 ½-length victory and set a track record in the Travers, the centerpiece of Saratoga’s glitzy summer meet. Arrogate went on to three more sensational victories in the ensuing six months, establishing himself as the best racehorse on earth. (That status is in doubt today, but stay with me for now). Racing is a sprawling, coast-to-coast enterprise contested daily at dozens of racetracks, but the sport’s mainstream appeal rests with the emergence of greatness. Arrogate was great, and his emergence came as the memory of 2015 Triple Crown winner American Pharoah was fading and as the popular California Chrome was closing out his spectacular and unlikely career. So it was on Saturday that another Baffert-trained three-year-old, West Coast, won this year’s Travers. He did not win by 13 ½ lengths, but instead by a very convincing 3 ¼ lengths over Gunnevera and another 2 ¼ over Irap, two horses who won Kentucky Derby prep races last winter and spring and had been very much alive in the wagering on the First Saturday in May. Perhaps West Coast will prove great. He has won four consecutive races and his front-running winning time of 2:01.19 was more than respectable. But his victory came on a day when the sport explained just how rare it is to witness sustained excellence on the racetrack and just how capricious the game can be. 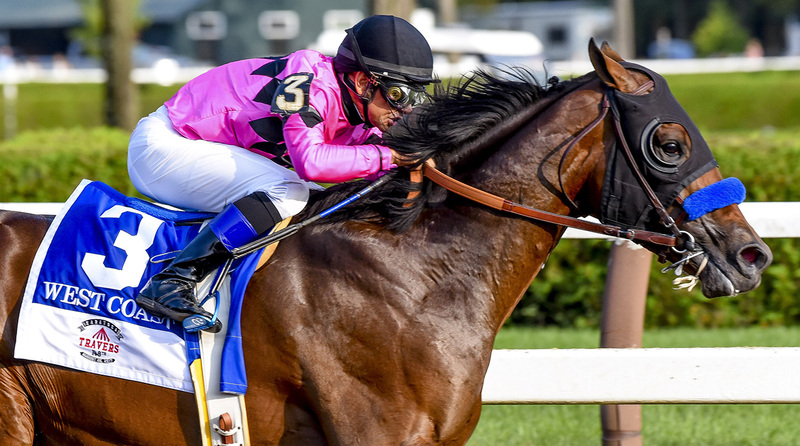 For the first time since 1982, the Travers, the so-called "Midsummer Derby" had brought together the winners of all three Triple Crown races: Derby winner Always Dreaming, Preakness winner Cloud Computing and Belmont winner Tapwrit. Under the wire, Tapwrit was fourth, Cloud Computing was eighth and Always Dreaming ninth; collectively, they finished 42 lengths behind West Coast. Their victories in the spring seem impossibly distant. "One of those years," said Todd Pletcher, who trains both Tapwrit and Always Dreaming. "Different horses winning different races." Baffert, who watched the race at home in California, took another line: "It’s a nice group of horses. A nice group of three-year-olds. We got spoiled by American Pharoah. We got spoiled by California Chrome. We got spoiled by Arrogate. Those horses that keep it going, those are superior, superior racehorses. You don’t see horses like those very often." Saturday’s first dose of racing reality came more than three hours before the Travers. In the 70th running of the Personal Ensign Stakes, four-year-old filly Songbird, beaten just once in 14 lifetime starts, was run down in the homestretch by Forever Unbridled. Songbird’s only previous loss was in last fall’s Breeders Cup Distaff, when she took on six-year-old champion Beholder and was beaten by a nose at the wire in a sensational race. On Saturday, Songbird made an easy lead at a reasonable pace (24.14 seconds for a quarter mile, 47.91 for the half and 1:12.29 for three-quarters), but could not hold off Forever Unbridled, a very solid filly, in the final furlong. After that race, Songbird’s jockey, Mike Smith, struggled for an explanation. "She’s not supposed to get run down, but she got run down," said Smith. "She was giving me all she had. She’s still running fast. Maybe she hasn’t gotten faster from [age] three to [age] four. Or maybe those other fillies did get faster. She’s only lost two races in her life." (Forever Unbridled is a five-year-old who had run against Songbird just once before Saturday, in that same Breeders Cup race last fall). Yet Songbird’s defeat was more than just a cold shower on greatness. It was also the first phase of a Travers plan that unfolded over the course of a 72-degree afternoon, in plain view of 47,725 spectators. Smith, whose industry nickname is "Big Money Mike," is the regular rider on several of Baffert’s top horses, including Arrogate. (Songbird is not trained by Baffert, but by Jerry Hollendorfer). Between Songbird’s defeat and the Travers, Smith would ride the Baffert-trained Drefong in the Forego Handicap, a seven-furlong sprint. Drefong won last year’s Breeders Cup Sprint and is being pointed toward that race again, for this year’s Breeders Cup at Del Mar Race Track in California, on the first weekend of November. Drefong likes running in front, but in a text exchange with Smith before the Forego, Baffert noted that Songbird had been run down, and expressed concern that the track might be playing to favor closers. "That wasn’t the problem," Smith told Baffert. "She was running well. She just got caught." Together they decided that Smith would get to the lead in the Forego. Drefong went to the front and ran away to an easy victory. "After that," Baffert said, "We looked at the Travers and saw maybe there wasn’t too much speed in the race. I told Mike, 'If you can steal, go ahead and steal it.'" In the shaded saddling paddock, 15 minutes before post time, Smith approached West Coast’s co-owner, Gary West, who also been texting with Baffert, and told him, "If we can get an easy lead, I’m going to take it." He got an easy lead. "I didn’t think there was much pace in the race," Smith said after the race. "My horse jumped out of there, so I took advantage of it." West Coast had been just a step behind the frantic race to make the Kentucky Derby last spring. After breaking his maiden in March in California, he finished second in the Lexington Stakes at Kentucky’s Keeneland Race Course, just three weeks before the Derby. Baffert considered running him in the Belmont Stakes, but instead opted for the shorter Easy Goer Stakes on the Belmont undercard. West Coast won that race easily and then rolled back to a victory in the Los Alamitos Derby on July 15. Meanwhile, many of the spring stars wobbled. Always Dreaming was third and Cloud Computing fifth behind Good Samaritan in the July 29 Jim Dandy at Saratoga, a traditional prep for the Travers. Girvin beat McCracken in an unspectacular Haskell at Monmouth Park. Tapwrit sat in his stall. The lack of dominant performances put 12 horses in the starting gate for the Travers and made West Coast the third betting choice at 6-1. (Good Samaritan was the 4-1 favorite). And Smith put himself on the lead. West Coast went the first quarter in 23.82 seconds, which is not dawdling. But Smith slowed the pace to 24.30 seconds for the second quarter and then tacked on a 24.11 down the backside, holding a half-length lead over Always Dreaming and Irap. Always Dreaming, so dominant in winning the Kentucky Derby, faltered on the turn. Cloud Computing ran hardly a step, Girvin even less, en route to an 11th-place finish. Smith covered the turn in 24.59, keeping the lead. Stewart Elliott aboard Smarty Jones (Blue) races against Lion Heart (orange) in the 2004 Kentucky Derby. Jockey Calvin Borel celebrates winning the Kentucky Derby atop Mine That Bird. Horses and jockeys take the final turn in the 2003 Kentucky Derby. Mine That Bird (8), with jockey Calvin Borel aboard, races to the finish! Gary Stevens aboard Thunder Gulch took home the top prize in 1995. Thunder Gulch stands at the Winner's Circle, with trainer Wayne Lukas greeting the horse and jockey. Fans cheer as Thunder Gulch leads down the backstretch. Bodemeister (6) and jockey Mike Smith, right with a turquoise helmet, and Trinniberg (9) with jockey Willie Martinez, left with a red helmet, lead the field around the first turn. Kent Desormeaux riding Big Brown to victory in the 2008 Kentucky Derby. Leaving the quarter pole, Smith threw a cross on West Coast and opened a little air. Irap and jockey Mario Gutierrez hung with West Coast until inside the furlong pole, when Smith eased away, having ridden a brilliant tactical race, the stopwatch ticking in his 52-year-old head. "We got control of the canoe for one more year," said Baffert, a reference to the canoe that floats on a small pond on the Saratoga infield, painted in the colors of the Travers winner. (Baffert became the first trainer with consecutive Travers winners since Shug McGaughey in 1989-’90). Baffert is the biggest human name in the sport, but it has been a frustrating summer. Arrogate, so brilliant a year ago, has inexplicably lost his last two races, first a stunning fourth-place finish in the San Diego Handicap on July 22 and then a game second behind Collected, another Baffert horse, in last weekend’s Pacific Classic, at Del Mar. "At least Arrogate tried in the Pacific Classic," said Baffert Saturday. "It wasn’t his best, but he tried. We’re working on it." West Coast’s victory in the Travers comes with an invitation to the Breeders Cup Classic, but neither Baffert, West nor Smith will commit to their plans. The picture is murky now. Sober reality persists and greatness lurks at arm’s length. More races ahead. More to prove.